Gerry Rig Live Bait Clip Miami Fishing Supply, complete selection of offshore fishing tackle, marine electronics and boat supplies. 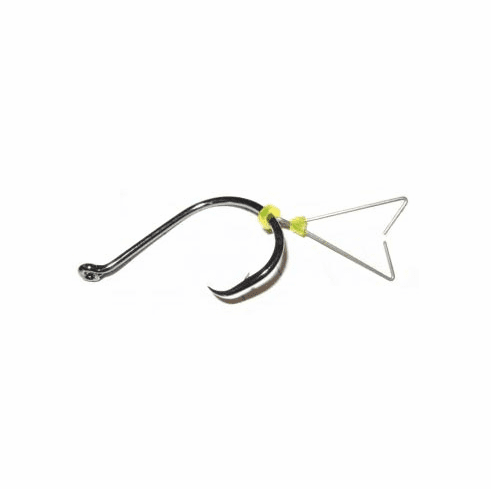 Gerry Rig Live Bait Rig is a reusable bridle designed for circle hooks. This gerry rig allows the hook to rotate 90 degrees left or right which gives you a high hook up percentage. - For flat line and casting, push clip on bridge of nose until the prongs snap into nostrils or eye sockets. - For kite fishing, bobbers and balloons, push clip down on back. Pull up slightly until prongs lock in. - To remove the bait clip, pull one prong out at a time.